When I studied art and pre-Columbian history in San Miguel de Allende Guanajuato Mexico 1977-78 I was fascinated by the idea of a shipload of my countrymen chancing to immigrate to the Yucatan peninsula long before Columbus. I got it from Hans Ebeling’s historybook Die Reise in die Vergangenheit III. Die Europäer gewinnen den Erdball. Geschichte der Neuzeit bis 1789 translated and adopted for Icelandic readers. It tells of how king Moctezuma II welcomed Hernando Cortes as Quetzalcoatl returning from the east. Translator Guðrún Guðmundsdóttir and husband historian Björn Thorsteinsson who wrote the epilogue suggest that Quetzalcoatl was a northern medieval hero: Eyrbyggja saga describes how Björn Breiðvíkingakappi (Björn the champion of the Broadwickers) lost his course leaving Iceland for Europe. Persistant northern winds blew his ship far southwest to a foreign land where he became chieftain. When the millannial havoc of Leifs Eiríkssonar discovery of America started I felt it was my duty as a native historian part-educated in Mexico to compare the two myths. The jungle of Meso-American history is a headache, I was well aware of how unqualified I am so I asked for a grant to contact Mexican specialists on the subject. Rejected I decided to make do with what I had, updated my books and dug into Quetzalcoatl lore as best I could, amazed that no one seemed to have scanned them for Scandinavian clues. The bridge where Björn meets Quetzalcoatl is huge in terms of world history and of rainbow quality. Eyrbyggja saga is as valid a source as the sagas that tell of the Greenlanders’ immigration to Vinland. Archeological findings have confirmed their settlement in L’Anse aux Meadows Canada beyond doubt. Archeologial artifacts proving Scandinavian settlement of a crew of men in Mexico are extremely unlikely to be found. Medieval legends are less pulpable sources than archeolgy but if they mirror each other they can be taunting. The myths of B and Q seem to have more in common than pale skin, full beard and the fact that he came sailing from the east. But please, bear in mind while you read this that mythical theorizing has nothing to do with historical reality, it´s a dimension concerned with beauty and fairy tales and can not be taken seriously. According to Eyrbyggja saga Björn Breiðvíkingur Ásbrandsson, bynamed Champion during his viking route back in Europe, leaves his native Iceland because of illicit love. Björn had had an affair with married lady Thurid, wife of Thorod Tax-Catcher, and people were convinced their son was his offspring. When affronted by Thurid’s brother, magistrate Snorri goði, Björn admits that living in the same country he can’t stay away from his love Thurid. Staying would mean bloodshed. Under physical threat, taken by surprise without his weapons, Björn promises Snorri to go live for a few years in Europe. The North-Atlantic ocean is an efficient barrier when love is beyond control. Therewithal they parted, and Snorri rode to the ship and then home to Holyfell. Next day Björn rode south to the ship at Lavahaven, and took a berth for himself there that summer. Somewhat late ready were they, and they fell in with a northeaster, which prevailed long that summer, and nought was heard of that ship for long after. … late in the days of King Olaf the Holy († 1030) Gudleif went a merchant voyage west to Dublin, and when he sailed from the west he was minded for Iceland, and he sailed round Ireland by the west, and fell in with gales from east and north-east, and so drove a long way west into the main and south-westward withal, so that they saw nought of land; by then was the summer pretty far spent, and therefore they made many vows, that they might escape from out the main. But so it befell at last that they were ware of land; a great land it was, but they knew nought what land. Then such rede took Gudleif and his crew, that they should sail unto land, for they thought it ill to have to do any more with the main sea; and so then they got them good haven. And when they had been there a little while, men came to meet them whereof none knew aught, though they deemed somewhat that they spake in the Erse tongue. At last they came in such throngs that they made many hundreds, and they laid hands on them all, and bound them, and drove them up into the country, and they were brought to a certain mote and were doomed thereat. And this they came to know, that some would that they should be slain, and othersome that they should be allotted to the countryfolk, and be their slaves. And so, while these matters are in debate, they see a company of men come riding, and a banner borne over the company, and it seemed to them that there should be some great man amongst these; and so as that company drew nigh, they saw under the banner a man riding, big and like a great chief of aspect, but much stricken in years, and hoary withal; and all they who were there before, worshipped that man, and greeted him as their lord, and they soon found that all counsels and awards were brought whereas he was. So this man sent for Gudleif and his folk, and whenas they came before him, he spake to them in the tongue of the Northmen, and asked them whence of lands they were. They said that they were Icelanders for the more part. So the man asked who the Icelanders might be. Then Gudleif stood forth before the man, and greeted him in worthy wise, and he took his greeting well, and asked whence of Iceland he was. And he told him, of Burgfirth. Then asked he whence of Burgfirth he was, and Gudleif told him. After that he asked him closely concerning each and all of the mightiest men of Burgfirth and Broadfirth, and amidst this speech he asked concerning Snorri the Priest, and his sister Thurid of Frodiswater, and most of all of the youngling Kiartan, who in those days was gotten to be goodman of Frodis-water. But now meanwhile the folk of that land were crying out in another place that some counsel should be taken concerning the ship’s crew; so the big man went away from them, and called to him by name twelve of his own men, and they sat talking a long while, and thereafter went to the man-mote. Thereafter they parted. Gudleif and his men put to sea, and made Ireland late in the autumn, and abode in Dublin through the winter. But the next summer Gudleif sailed to Iceland, and delivered the goodly gifts there, and all men held it for true that this must have been Björn the Broadwick Champion; but no other true token have men thereof other, than these even now told. Thus ends the account of Björn’s chieftaindom in America. Eyrbyggja saga was written before the middle of the 13th century. Its first English translation was published in 1814. In 1875 E. Beauvois, member of the antiquity society in Copenhagen, published a lecture held at the international assembly of America-n-ists in Nancy France. He called his essay La Découverte du Nouveau Monde par les Irlandais et les Premiéres Traces du Christianisme en Amérique avant l’an 1000. Beauvois sources are ancient Irish stories about the discovery of western lands. Beauvois mentions Landnáma’s (12th century, book of Icelandic settlement) account of Hvítramannaland (Land of white men) that Snorri Sturluson (1178-1241) says some called Ireland the great, as well as Eyrbyggja’a account of the fact that Guðleifur and his men thought the natives around Björn the Champion of the Broadwickers spoke Irish. Distance from the sources always poses danger of error: Guðleifur was Norwegian – as probably those of his crew that were not Icelandic. The original text clearly implies that they were unsure of the language they heard „but rather thought it might be Irish“ = „helst þótti þeim sem þeir mæltu írsku“. Gaelic tounges were probably the only foreign tongues the crew had heard. Coming directly from Ireland they should have recognized Irish beyond doubt. Ari Fróði’s (historian 1067-1148) Íslendingabók tells of Irish monks in Iceland before the settlement 870 and as we have a tradition of trusting old books it has been accepted that they sailed up here in their small boats. But since New world herbs nicotine and cocain were discovered in Egyptian mummies historians are doubting the old notion of the Atlantic as an uncrossible barrier. Historians now feel more inclined to keep an open mind concerning long distance sailing. Beauvois’ paper aims to prove that the Irish were the first Caucasians to discover and colonize the New World and he beliefs that the big land that Björn’s and 30 years later Guðleif’s ships chanced upon was ruled by the Irish. Icelandic scholars considered the story of Björn’s crew’s chance migration to America too obvious a fairytale to consider seriously. They had little knowledge of Meso-American history and already a handful trying to convince the world of the authenticity of closer to home Leif Ericson’s tale. Quetzalcoatl is said to have detested human sacrifice. Historian Henry Bamford Parkes denied the possibility of Quetzalcoatl being Scandinavian because the Scandinavians didn’t accept christianity until the 11th century. This is not intirely true. Iceland accepted universal christianity at Alþingi in the summer of 999, scared by the prospect of doomsday during the millanium 1000. (New year started in the autumn). Icelanders were semi-christian around that time, and since the immigration around 870 had enough contact with christianity in the Britsh isles to have developed a distaste for human sacrifice. Recent genetic research proves that more than 60 % of the Icelandic female line are of Irish stock, and by 930 the country was settled. Eyrbyggja’s chronology dates Björn’s departure to the last weeks of 998 and he definately was well acquainted with christianity. It we take Henry Bamford Parkes line of reasoning furhter – putting the picture of legendary Quetzalcoatl into the frame of Scandinavian culture at that time – we are easily tempted to see vague probabilities in the Icelandic/Mexican contact. But let´s not jump to conclusions, the similarities are circumstantial and the Quetzalcoatl legends quoted have been misinterpreted, exaggerated and distorted. The vision can never the less be enjoyed like any good fantastic story or fairy tale – if you like. The name Quetzalcoatl is from the later conquering Aztec tounge and means Winged or Feathered Serpant. Let’s assume that sailing experts accept the possibility that clouded skies plus strong winds and/or currents fated a viking ship from Iceland and Ireland all the way to the shores of Yucatan. The vikings did sail the Mediterranean, to Greenland and down the east coast of America with ease, so this is not such a far out suggestion, given the right conditions. The natives most certainly would have marvelled at the ship as their native vessels were tiny boats in comparison. The beak of a vikingship happens to be a head of a serpant and the flanks of the ship make the serpant look winged. They are quite a sight if you stand on the shore and watch. Vikingships were meant to scare and impress, and having an almost flat bottom they are excellent for sailing shallow waters as well as deepest seas. What would the inhabitants call the leader of the men on board? The obvious word describing the big ship – Winged Serpant – might have become Björn’s name with the natives, as men tend to carry the name of the place they come from. Björn was from Broadwick but to the Indians he was of the ship. Yes, it´s a wild guess, but becomes less offending to the intellect as more pieces are added to the puzzle. Chieftain Quetzalcoatl was called Tepoztlán or Topiltzin in the tounge of the Toltecas and bynamed Ce Ácatl or „Year One Reed“. He is thought have ruled the Toltecs in 923–947. Scribes of the old Mexican annals disagree on important historical dates, making the dating of medieval events through written sources difficult. The Meso-American calander on the other hand was excellent, measuring the cycles of moon and venus so accurately that the gregorian calander blushes in comparison. There was less doubt about Quetzalcoatl’s arrival upon the scene at „year one reed“ in the 52 year cycle. According to my sources Tepoztlán impressed the Toltecas and the Maya with foreign ideas that had considerable effect on their culture. 1) Ce Ácatl Tepoztlán Quetzalcoatl is said to have introduced columns in Mexican architecture, that helped support the roofs but made their buildings more spacious. This is a distinct trait of old Scandinavian architecture, they used columns to devide their big halls of timber. 2) Tepoztlán is praised for the introduction of metallurgy and the cutting of jade. 3) Instead of humans he recommended that serpants, birds and butterflies were used for religious sacrifice. 4) He is said to have introduced the idea inherited by the Aztecas that the soul of those who died in battle would unite with the gods. According to old Scandinavian religion the valkyries visited the battlefield to guide the slain to Valhöll, the city of Óðinn (Wodan), while ordinary men went to earthbound Hel after death. 5) One variation of the Quetzalcoatl theme says that when he died he demanded his body be put on a funeral pile and burned, which is a common viking funeral. Doesn´t this merit further investigation? that carry the sign of god. My source does not mention the age of this verse, but historians have explained the beard away as a trait added on a written copy after the arrival of the Spanish. But the natives hardly liked their conquerors enough to praise them with a verse of this kind? Or did they? Ce Acatl is said to have thought his face ugly, so he let his beard grow to hide it, and eventually wore a white mask to hide it. This can be interpreted either way: The natives naturally would think a Scandinavian strange = ugly and thus explained his beard away as a screen or a mask. Or the legend of a white mask got so distorted that representations of Quetzalcoatl as a white bearded man became common. Björn the champion of the Broadwickers sailed away from Iceland just before the end of year 998. It’s a conincidende that 999 is year one reed according to the Mexican calander (= Quetzalcoatl’s birth/arrival). The huge 52 year wheel had taken excactly ten turns in 1519 when the Spanish landed on the Yucatan peninsula. According to Hernando Cortés the Aztecas were convinced that Quetzalcoatl indeed had returned as prophesized. Inspite of their militaristic society they gave them a warm welcome. Quetzalcoatl had become a favorite god of the Aztecs, who ruled after the Toltecs. According to them Quetzalcoatl disappeared the same year as he arrived or year one reed, that is to say 52 years later. Be this true for Björn he reached more than ripe old age. The preasts and learned ones were thrilled by the seemlingly devine intervention of the first Spanish landing in year one reed. Cortés had the good sense to sail at the tip of fortunes wheel. Cortés dreaded landing on the Yucatan peninsula because the coast has strong currents as well as dangerous reefs and shallows. Björn warns against this in Eyrbyggja saga: „the land also is wide, and harbours are ill to find therein“ … even for vikingships who can sail up shallow rivers. Cortés only ventured there to follow fugitives from Cuba. Because of the dangerous coastline his ships anchored far away from the coast. Despite that caution the ships ran into serious trouble drifting and scratching their bottom. Cortés’ only had an army of 400-500 men, but because of cruel Aztec rule he easily incorporated warriors of subjugated tribes. Possibly the Quetzalcoatl myth also had something to do with their submission. To Cortés’ astonishment Moctezuma II, the Aztec king, greeted him as a long awaited friend. The king proved well versed in Quetzalcoatl´s legends and the prophesy of his return. 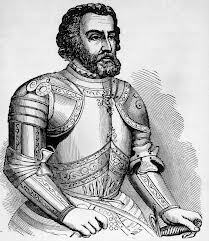 Hernando Cortés describes this first meeting with king Moctezuma in a letter to his emperor, Carl V. The Aztec king told him of old manuscripts describing how Mexican people once were ruled by a chieftain that sailed from the east. This chieftain had had numerous descendants who steadfastly believed that from the direction of the rising sun a chief would again come to rule their land. When Cortés described his emperor Carl V, the ruler of the world across the eastern sea, Moctezuma assumed that providence expected him to confiscate his kingdom. The great warrior king was ready to bow to fate, with fatal repercussions for his people. True, resistance only would have delayed the inevitable conquest … but it might have been a comfort for degraded Indians of future centuries to know that their ancestors had fought with all might against their oppressors? Some historians have doubted the sincerity of Moctezumas humble conduct, seeing it as face value courtesy to foreign ambassadors. They think the king entertained Cortés with these old stories to deceive him. But by the time Moctezuma realized that the conquestadores where enemies with powerful guns and no respect for his culture and people they had already sneaked their way into the heart of his empire. It was too late for successful resistance. A new age had begun. The era of the fifty-second sun was, according to Aztec religion, over. How dramatic is that! The Meso-American calander was tuned to the fate of the continent, directed by the external forces of European colonization … main characters in that tragedy being quasi-historical Quetzalcoatl and Cortés. Eyrbyggja saga’s account of how Björn the champion of the Broadwickers became a chieftain in the New World humbly begs for attention. It needs to be considered by specialists of pre-Columbian history in connection with the Quetzalcoatl lore. When they denounce the saga as having nothing to do with Mexico an old bug will be brushed off the great body of American History. In the dustbin with other quack theories it won´t bite our fancy any more. Beauvois, E.: La Découverte du Nouveau Monde par les Irlandais et les Premiéres Traces du Christianisme en Amérique avant l’an 1000. Congrés International des Américanistes, Nancy, 1875. The Broken Spears. The Aztec account of the Conquest of Mexico. Útgefandi Miguel León-Portilla Beacon Press, 1966. Bushnell, G. H. S.: The First Americans. The Pre-Columbian Civilizations. Thames and Hudson, 1968. Clendinnen, Inga: Aztecs – An Interpretation. Cambridge University Press, 1991. Coe, Michael D.: The Maya. Penguin, 1971. Cortes, Hernardo: Hernardo Cortés, Five Letters, 1519-1526. Translated by J. Bayard Morris, with an Introduction. First Published 1928. W. W. Norton & Company, án ártals. Ebeling, Hans: Die Reise in die Vergangenheit. Ein geschictliches Arbeitsbuch. Band III. Die Europäer gewinnen den Erdball.Geschichte der Neuzeit bis 1789.Mit Bildern von Gustav Rüggeberg. Georg Westermann Verlag, Braunschweig, 1959. Ebeling, Hans: Ferð til fortíðar. Evrópumenn sigra heiminn. Nýöld til 1789. Guðrún Guðmundsdóttir þýddi og endursagði. Litróf – Sögufélagið, 1969. Elliott, J. H.: “The Spanish Conquest and settlement of America.” The Cambridge History of Latin America. Volume 1, Colonial Latin America. Cambridge University Press, 1984. Eyrbyggja saga. Íslendingasögur 1. Svart á hvítu, 1987. Goncalves de Lima, Oswaldo: El maguey y el pulque. En los códices mexicanos. Fondo de cultura económica, 1986. Íslensk fornrit IV. Eyrbyggja saga et al. Einar Ól. Sveinsson og Matthías Þórðarson gáfu út. Hið íslenska fornritafélag, 1935. Íslendinga sögur 3. b. Snæfellingasögur. Guðni Jónsson bjó til prentunar. Íslendingasagnaútgáfan, 1953. Katz, Friedrich: The Ancient American Civilisations. History of Civilisation. Weidenfeld and Nicolson, 1972. León-Portilla, Miguel: “Mesoamerica before 1519.” The Cambridge History of Latin America. Volume 1, Colonial Latin America. Cambridge University Press, 1984. Ólafur Halldórsson: Horfnir heimar. Nýju ljósi varpað á leyndardóma sögunnar. Örn og Örlygur, 1986. Parkes, Henry Bamford: A History of Mexico. Eyre and Spottiswoode, 1962. Paz, Octavio: Tho other Mexico: Critique of the Pyramid. Grove Press, 1972. Porter Weaver, Muriel: The Aztecs, Maya, and Their Predecessors. Archeology of Mesoamerica. Seminar Press, 1972. Sabloff, Jeremy A.: The Cities of Ancient Mexico. Reconstructing a Lost World. Thames and Hudson, 1989. La Saga de Snorri le Godi. (Eyrbyggja saga). Traduction, introduction et notes de Régis Boyer. Aubier Montaigne, 1973. Soustelle, Jacques: Daily Life of the Aztecs, on the Eve of the Spanish Conquest. Penguin, 1964. „Af höfðingjanum Quetzalcoatli og Birni Breiðvíkingakappa.“ Lesbók Morgunblaðsins, – autumn 1998. „Var Björn Breiðvíkingakappi skeggjaði höfðinginn Quetzalcoatl sem kom úr austri?“ Kvennaslóðir. Rit til heiðurs Sigríði Th. Erlendsdóttur sagnfræðingi. Kvennasögusafn Íslands, 2001. Wachtel, Nathan: “The Indian and the Spanish Conquest.” The Cambridge History of Latin America. Volume 1, Colonial Latin America. Cambridge University Press, 1984.
mynd 2: Steinum prýdd trémynd af Quetzalcoatli. mynd 3: Módel af höfuðborg Azteka, Tenochtitlan. Hans Ebeling: Ferð til fortíðar, 47. Ebeling, Hans: Die Reise in die Vergangenheit III.Die Europäer gewinnen den Erdball, 53. The Saga of the Ere-Dwellers, end of chapter 47. The Saga of the Ere-Dwellers, of chapter 64. An alternate name for any Goidelic language. Íslendinga sögur 3. b., vii. E. Beauvois: La Découverte du Nouveau Monde par les Irlandais, 41-49. La Saga de Snorri le Godi, 36-37. Henry Bamford Parkes: A History of Mexico, 15. Íslensk fornrit IV, xxxi, xxxiv. Friedrich Katz: The Ancient American Civilisations, 158. Michael D. Coe: The Maya, 138-139. Muriel Porter Weaver: The Aztecs, Maya, and Their Predecessors, 204-205, 308. Miguel León-Portilla: „Mesoamerica before 1519,“ 16. Friedrich Katz: The Ancient American Civilisations, 123. Jacques Soustelle: Daily Life of the Aztecs, 15, 44, 70, 83, 110, 118, 124, 128-129, 177-178, 222, 240. Michael D. Coe: The Maya, 83. Michael D. Coe: The Maya, 141. Jacques Soustelle: Daily Life of the Aztecs, 15. Michael D. Coe: The Maya, 140, 148. Michael D. Coe: The Maya, 158. Hernardo Cortés, Five Letters, 1519-1526. Nathan Wachtel: „The Indian and the Spanish Conquest,“ 208-209. Octavio Paz: The other Mexico: Critique of the Pyramid, 98. Hernardo Cortés, Five Letters, 1519-1526, 6-7. Hernardo Cortés, Five Letters, 1519-1526, 70-71. J. H. Elliott: „The Spanish Conquest and settlement of America,“ 181. Friedrich Katz: The Ancient American Civilisations, 157.